If the news of Amazon.com's new fulfillment center opening in Bakersfield seemed to come out of nowhere, it's because the company asked Kern County Board of Supervisors to keep it quiet. "They have a certain way they like to conduct business, we're not here to put up roadblocks of those big time employers who come and locate here in Kern County," Maggard said during a live interview with 23ABC's Tim Calahan. "We wanted to make sure that they got what they wanted, so we can deliver the jobs so essential to our economy." 23ABC was first to report the news of Amazon opening a fulfillment center near Meadows Field Airport, which according to the county's Twitter post Monday exclaimed "Permits done, escrow closed, construction starting now." The project, and the decision to allow Amazon to locate to Kern County seemed to never appear on an agenda before Supervisors. "The county is not subject to confidentiality, we're government," He said of the process to bring Amazon to Kern. "We were very carful how we answered questions about this, we wanted to make sure they got what they wanted." Last year Amazon passed on Bakersfield during a nation wide search for it's second company headquarters, Austin Texas was selected for the designation. 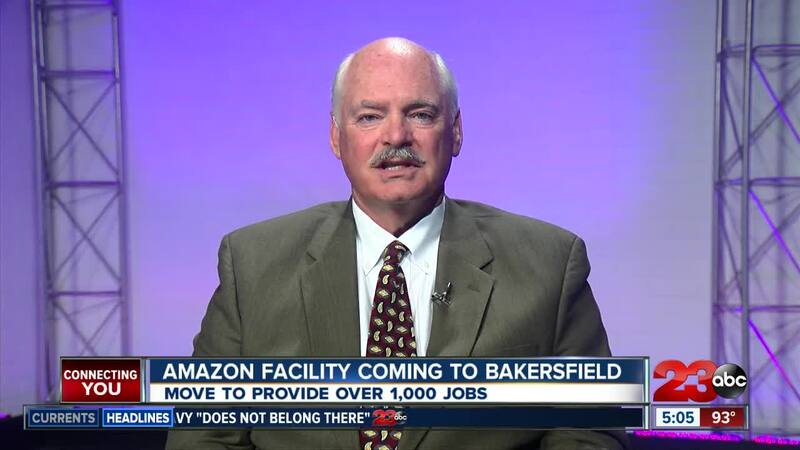 But the news of Amazon choosing Bakersfield for a fulfillment center Maggard said is great news. "It's also was a shot in the arm to our financial picture," he said. Local leaders have been looking for ways to get the county out of the financial crisis made worse by the downturn in the price of oil, and this, along with other major companies relocating to our area is a sign of a turning tide. In the past decade, giants in retail and ecommerce choosing to relocate major sectors of their business to Kern, including IKEA, Target and most recently L'Oreal all opening distribution centers up and down the valley. "It's a sector waiting to explode," Maggard said. Kern County known for energy, agriculture and innovation--now adding distribution and ecommerce to it's diverse industry. "We are right in the middle of the lines of delivery, with trains and highways, were perfectly situated for that," Maggard said. "Others are lining up with interests right now wanting to come here as well."